Solar PV VSD Pump Kits – NEW!!! Smartmulti SOLAR PV PUMP INVERTER INVT GD100-01 & GD200-01 Variable speed drive Inverters are well positioned in an environmentally friendly and economical PV market. The product has been specifically designed for Solar Panel driven pumping systems with water storage instead of electric storage and with no need for expensive battery backup. The direct current (DC) generated by Solar panels is a direct input into the Inverter which is then converted into three phase alternating voltage (AC) to drive various pumps directly. 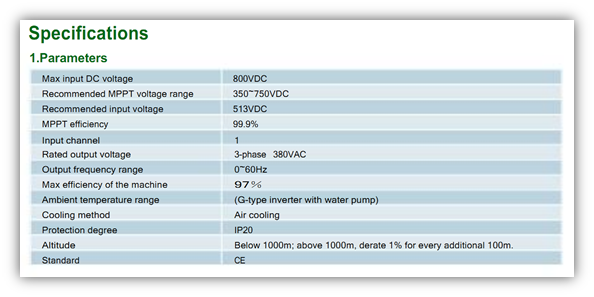 The Inverter will adjust output frequency in real time in accordance with sunlight intensity changes.